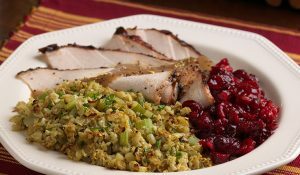 This delicious, low-carb stuffing will allow you to enjoy one of your favorite Thanksgiving dished, without the regrets! In a large skillet, melt butter over medium heat. Add onion, carrot, and celery. Saute for 7-8 minutes, until soft. Add mushrooms and cauliflower, season with salt. Cook another 8-10 minutes, until tender. Add in parsley, rosemary, and sage and stir until combined. Then pour broth over mixture and cover with a lid until totally tender and liquid is absorbed, about 15 minutes.